ArtJamz, a monthly event that blends painting, drinks and live music -- has always been a pop-up event. Not anymore. A new lounge at 1742 Connecticut Ave. NW will open to the public March 9. Cozy at 800 square feet, the new studio will allow groups of 10-25 patrons to enjoy a variety of drinks and refreshments while they paint. Customers can choose either a $65 fixed cost -- which includes beer, wine and vitaminwater zero, catering from Fuel Pizza, a canvas, unlimited paints and more -- or a $45 pay-as-you-go option. 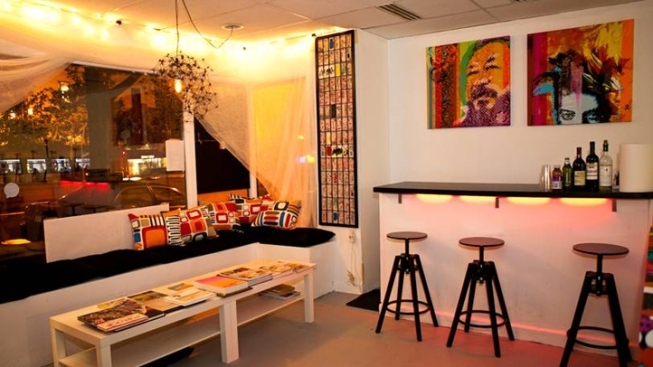 The space will also host KidsJamz sessions and private parties for adults and businesses. Self-proclaimed “artrepreneur” and owner Michael M. Clements was painting with friends on a shared canvas three years ago when the “aha” moment occurred that sparked the idea for the business. Since 2010, ArtJamz has operated as a rotating event with a core team of six employees, but it's now looking to expand by hiring art students and teachers. Speaking of swanky painting nights... LivingSocial recently opened a venue at 9th & F that also offers space for food, drinks and creativity, but with its new location ArtJamz says it doesn't see the online discounter as a threat. ArtJamz will also continue to offer its traveling sessions despite the new digs in Dupont.